. 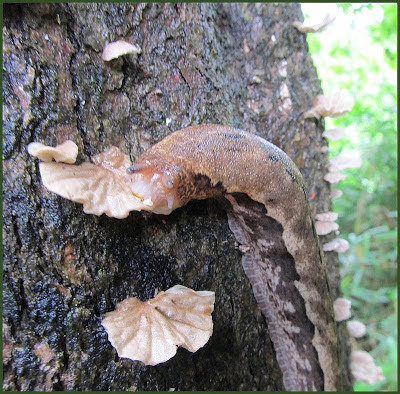 BIG snail, photo album .
. Ohaga in the Rainy Season . It was one of the worst strong rains with thunder going on for about four hours last night. 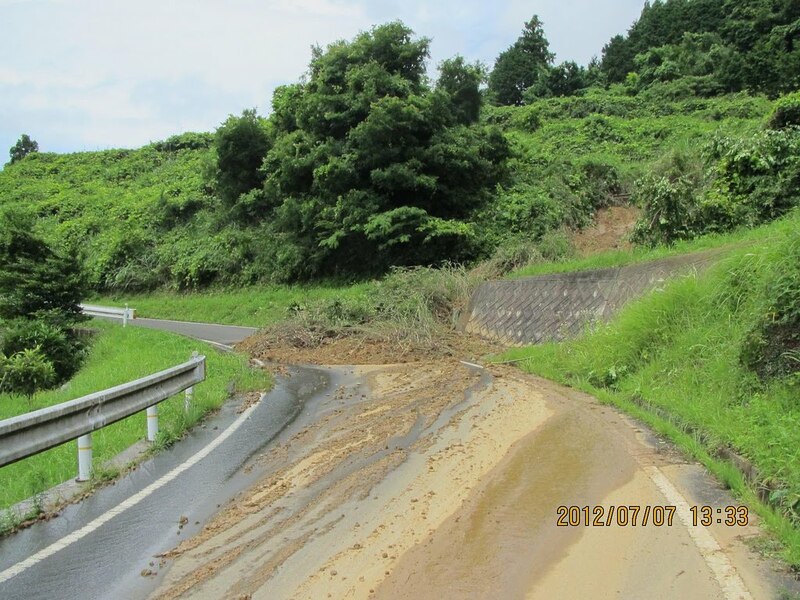 A lot of damage done in many parts of Okayama, Western Japan and Kyushu. And now the front moves north toward Tokyo and Tohoku.
. Mudslides in Ohaga . may reach central Japan through Fri.
Precipitation logged 67.5 millimeters per hour in Ishigaki Island, Okinawa Prefecture, and 46.5 mm per hour in Cape Ashizuri in Kochi Prefecture, both in southwestern Japan, according to the Japan Meteorological Agency. Slug is a common name that is normally applied to any gastropod mollusc that lacks a shell, that has a very reduced shell, or has a small internal shell. This is in contrast to the common name snail, applied to gastropods that have a coiled shell large enough that the soft parts of the animal can retract fully into it. 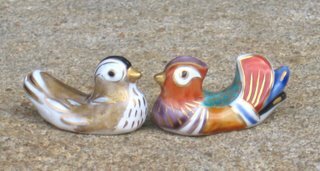 Slugs belong to several different lineages which also include snails that have shells. 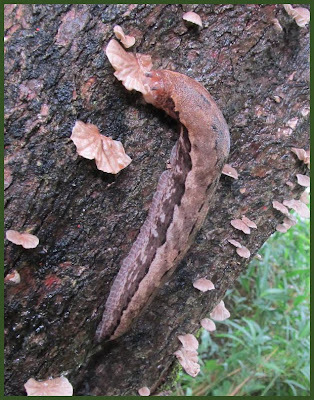 The various families of land slugs are not very closely related, despite a superficial similarity in the overall body form. The shell-less condition has arisen many times independently during the evolutionary past, and thus the category "slug" is emphatically a polyphyletic one. Best seen at the end and after the rainy season. APPEARANCE: As its name implies, the namekujira is a very large slug. Its body is described as reddish-brown in color, with a long stripe running down its back. From its head to its neck, it is covered in black spots. 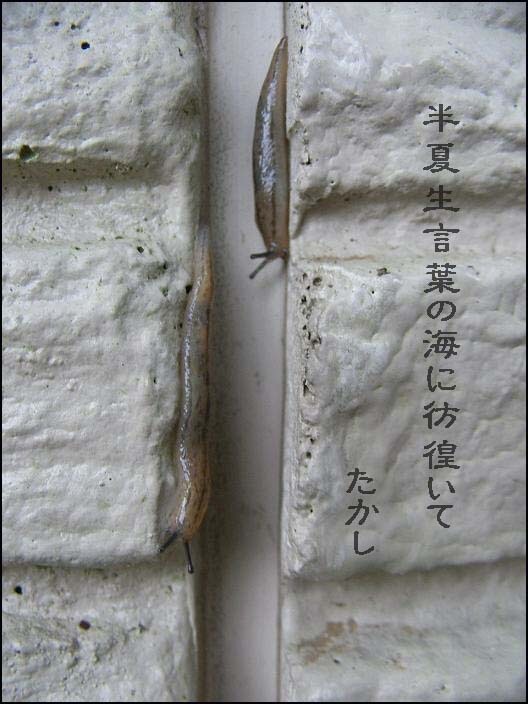 BEHAVIOR: Namekujira live in gardens and behave just like ordinary slugs. It is their size that makes them so strange. They crawl across doors and fences, leaving behind enormous, silvery slime trails up to 100 hiro in length—almost 182 meters. ORIGIN: Namekujira is described in the Kujirazashi shinagawa baori, a comical Edo-period book featuring different types of pun-based whale yōkai. Its name is a play on words, combining the words namekuji (slug) and kujira (whale). 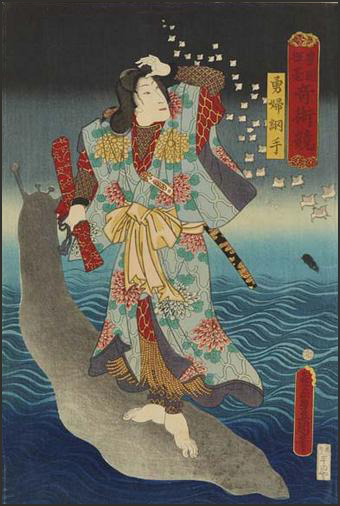 In addition to its name, this yōkai’s description contains one more pun. There is a dish made from whale intestines called kujira no hyakuhiro. The name literally means “whale’s 100 hiro,” which comes from the great length of the whale’s intestines. So the gag is that while kujira no hyakuhiro refers to a delicious meal, namekujira no hyakuhiro is just a 182 meter long slime trail. Once there was an actor with the stage name of タヌキ Tanuki. He got a message from his mother and was on his way home to visit her. On a pass where monsters come out at night it was already evening. 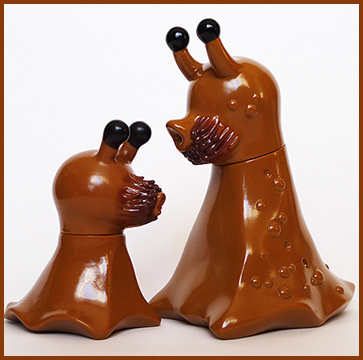 A namekuji slug monster came out and took him for a real Tanuki badger. The monster asked him for something that he was most afraid of, so he answered 金 Gold Money . The next evening the slug, who thought to fight him to the death, threw a box with 1000 gold coins (senryoobako 千両箱) into his home. Thus the clever Tanuki became a rich man. If you eat a raw Namakuji or a green frog, asthma will be healed. A man once helped a monkey which was captured by an octopus and got a Furoshiki 風呂敷 wrapper as a thank-you present. That night he stayed at a lodge. There was a huge storm and a monster seemed to blow in. The man pulled out the Furoshiki and pulled it over his bed covers. Then the wind stopped. When he looked closer in the morning, he saw a slug in the Furoshiki and it seemed the monster had slipped on it and disappeared. Sometimes a beautiful girl is seen at the edge of the pond. But whoever sees this girl will be eaten that night. Once a medicine vendor passed by the pond and saw a monkey crying. The monkey had a stomachache, so the vendor gave him some medicine. The monkey threw something at him and disappeared. That evening the vendor slept in a small room at a lodge when a huge serpent came out. It opened its huge mouth to eat him. So he threw the parcel from the monkey at the snake and it fled. Next morning the owner of the lodge came looking and they found that the present from the monkey had been a sludge, which is poisonous for the snake. Once a hunter was about to shoot a monkey, but then he took pity on the animal and let it go. On his way home from the forest, the monkey appeared again and gave him a slug. He wrapped it in a wrapper and continued his way home. Suddenly a 山女 "mountain woman" monster appeared and wanted to kill him. But this kind of monster is afraid of slugs, so she run away fast and the hunter reached home safely. This "mountain woman" is known as Yamahime 山姫 "Mountain Princess", a mountain monster.
. Yamanba, Yamauba 山姥 and 山姫 Yamahime Yokai . If people use kumasasa 熊笹 bamboo grass, that has been purified at the shrine during a Spring festival, and hang it in their kitchen, there will be no cockroaches or slugs entering the kitchen.
. Jiraiya 自来也 / 児雷也 "Young Thunder" . Takashi wrote this haiku in response to the image Yamada Hiromu painted. He points out the contrast to the Grand Shrine and the slimy animal as a great juxtaposition.
. taisha, ooyashiro, Ōyashiro 大社 .